There are over 500 Halong bay cruises offering Halong bay tours from luxury travel to adventure style. Here is Vietnam luxury travel collection of Halong tours. The list of Halong bay cruises may change every three month after the review of our customers' feedback and our staff's inspection. We are not the representative of any cruises and we just recomend the high-end Halong bay cruises to make our customers' Vietnam vacation unforgettable. Offer chances to explore fascinating Halong Bay in luxury, elegant, relaxing and fulfilling style like luxury 5 star hotels on land. Ms Jasmine takes you to untouched areas for unique experience. Commitment to Excellence, Excitement and Satisfaction. Limited offers for Halong bay tours - bestselling of luxury Vietnam tours. With 13 year experience on operating Halong Bay tours, Victory stars were born with the perfect combination of luxury comfort, elegance and tradition. Besides, the great Vietnamese cooking art and its amazing scenery all create some of the best days in your life. 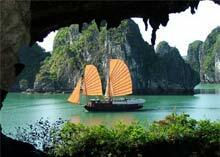 Halong Bay tour by Victory cruises offers the best Vietnam tours. Amazing Indochina cruises were designed in luxury, elegant and traditional style, based on the international standards of 5 star hotels on land. It is worth flying thousands kilometers to Vietnam for Joining Halong Bay tours - the best Vietnam tours. Then, go home. Limited offers for Halong tours, the highlight of Vietnam luxury travel style. Valentine Halong Bay cruise was designed with the attention to satisfy sophisticated travelers. Great food, luxury - elegant cruise and fascinating sea - mountain scenery will guarantee exceptional Vietnam vacation. Book Halong bay tours - highlight of Vietnam tours for the highlight of your lifetime luxury travel. Designed in luxury travel style for honeymoon trips and family vacations, together with fascinating scenery of Halong Bay, Prince cruises guarantee to make your Vietnam vacation exceptional. Limited offers for Halong bay tours, best-buy of luxury Vietnam tours. Ginger cruise focuses on the extremely perfect mixture of traditional design and luxury travel comfort. Halong Bay's exotic scenery , great Vietnamese food and its ultimate luxury room aim to satisfy the most discerning travelers. Limited offers for Halong bay tours in Vietnam luxury travel style. Small Victory star cruises and victory cruises were born to satisfy tourists' interest in luxury travel style at private atmosphere. Book Halong bay tours by Victory star cruise voted as top of Vietnam luxury tours, remember your vietnam vacation forever. With only 6 AC cabins designed in ultimate luxury, Violet cruise sets up the new style of Vietnam luxury travel. She is also the spirit of all Vietnam holidays. Halong tour by Ms Violet is considered as one of top luxury Vietnam tours. There are different routes for different Halong Bay tours. Please read carefully to choose your ideal Halong Bay tour. Join Halong bay tours - the bestselling of Vietnam tours for unique luxury travel style.